This Landscape Joomla Template will help you to incarnate the idea of making a stylish and functional website with minimal effort. 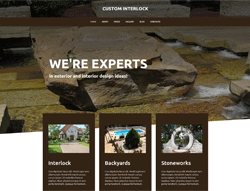 To take your business website to success, consider this elegant modern theme. It features a multipurpose design which adapts easily to meet the requirements of your business. You can use it as a basis for exterior, interior and furniture, design, photography, business, and many other websites. It is a professional template with a great range of features. This Landscape Joomla Template is an excellent template with a beautiful design and great functionality. Retina-ready images and effective atmosphere of the layout will catch the attention of your potential customers and drive them in.